Sigrid is a Nord living in Riverwood with her husband Alvor, the local blacksmith. She spends most of her day walking around the streets of Riverwood. If you choose to follow Hadvar during the quest Unbound, she and her husband will welcome you into their home. She has a daughter named Dorthe. She tends the garden behind the Sleeping Giant Inn during the day. She wears a set of clothes and a pair of boots. She carries a key to Alvor's house and sometimes a belted tunic or a piece of food. She wields an iron dagger. When approached, Sigrid will greet you with things like "Ain't used to strangers here in Riverwood. ", "Alvor and I, we got a daughter. Little Dorthe. ", "My girl likes to work the forge with her papa. ", and "All of that blacksmithing... It's not good for a little girl. Ain't... ladylike." If your character is male, Sigrid may warn you, "I'm spoken for, you know. So don't get any ideas." If your character is female, she will say, "You're pretty, I'll give ya that. Just stay away from my husband, Alvor." In the garden, she has additional lines of dialogue: "Dorthe needs to spend more time in the garden. I could use the help. ", "It don't matter what I grow - my Alvor, he'll eat anything. ", and "Maybe I'll do turnips next. Hmmm... Or maybe radishes?" If Alvor is dead, Sigrid can be found saying, "He would dote on her so much. Let her work the forge and everything. I miss him so." 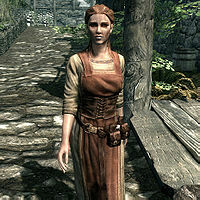 If asked what she thinks about the war, Sigrid will reply, "I just hope the war doesn't come to Riverwood. There's enough trouble in the world without those Stormcloaks stirring up more." She also provides directions to Whiterun, should you need them, "Just follow the road north. When you get to Honningbrew Meadery, turn left and the road will take you to the city gates. It's not far. We used to go to the market there every month or so, until the roads got so dangerous with the war and all." Hilde: "It seems like Dorthe grows a head taller every season." Sigrid: "Aye. She's helping me in the house, and even helps her father at the forge." Hilde: "She'll make a fine wife someday." Sigrid: "Thank Shor I have a lot of years before I have to worry about that!" Embry: "Care to have a drink with me, sweet Sigrid?" Sigrid: "Drunk again, Embry? Don't let Alvor hear you talking to me that way. He'll stick your head in his forge." Embry: "So that's a no I take it?" "Let me guess. You'd rather play 'Daedra and Battlemages' with Ordnar. Or go fishing, or catch frogs..."
This page was last modified on 27 February 2017, at 16:59.